Leighton Meester’s engagement ring from Adam Brody is an absolute beauty. With a four-carat cushion cut diamond bezel-set in rose gold, it has small side stones and serves as the perfect match to Leighton’s warm skin tone and classic brunette beauty. Giving a nod to Leighton Meester’s engagement ring, this design from brilliance features a center diamond surrounded by a gorgeous bezel. A halo of diamonds increases the ring’s visual impact, while the side diamonds on the split shank give the engagement ring even more glamorous sparkle. This example has a cushion cut diamond that gives it a unique, elegant look; an Asscher cut, radiant cut, or oval cut would work well here also. Born October 25, 1985, Leighton Meester is an American singer and actress. She starred as Blair Waldorf on The CW’s drama series Gossip Girl, and has played parts in a number of films including Country Strong, The Roommate, Monte Carlo, That’s My Boy, and The Oranges. In 2014, she took a role on Broadway, starring as Curley’s wife alongside Chris o’Dowd and James Franco in Of Mice and Men. Leighton has released two singles and has collaborated with a number of artists on songs for a variety of soundtracks. Since her early days when her style could be described as Pop, she has shifted to a focus on Folk music. In 2012, Meester embarked on a mini-tour with folk band Check in the Dark. Named one of People magazine’s 100 Most Beautiful People along with the cast of Gossip Girl in 2008, Leighton also made the Maxim Hot 100 List a number of times. BuddyTV ranked her 32nd on its “TV’s 100 Sexiest Women of 2010” list, and Men’s Health ranked her #30 on its “Hottest Women in 2011” list. Glamour magazine ranked her fifth among the Most Glamorous celebrities of 2011. Did you know that Leighton Meester worked as a model during her childhood? After moving to New York with her mother at age 11 and attending the Professional Children’s School, she signed as a model with Wilhelmina, booking a Ralph Lauren campaign. She also starred in commercials and posed in campaigns for Limited Too. Leighton and her husband, Adam Brody, met while on the set of The Oranges. The two dated for a year before announcing their engagement in November of 2013. They were married in a private ceremony during February of 2014. What Our Experts Have to Say about Leighton Meester’s Engagement Ring. Leighton Meester’s engagement ring is like her: Classically beautiful, with a little something different that makes it stand out. That “something” is the unique cushion cut diamond combined with a bezel setting and small side stones. The center diamond appears to be about four carats, and the ring’s setting looks like rose gold. Celebrity engagement rings like Leighton’s are truly incredible works of art, often produced by top jewelers in Hollywood. 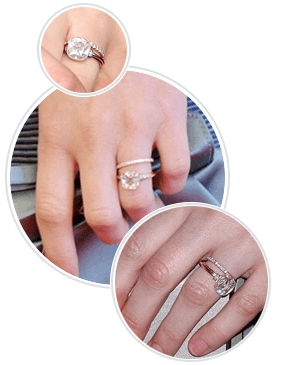 These rings, often worth tens to hundreds of thousands, are so glamorous that many normal women simply shake their heads and think, “it’s out of my league.” The good news is that you can easily create a gorgeous look inspired by Leighton Meester’s engagement ring without spending more than you have allotted. Brilliance not only offers a number of incredible pre-set designs, we also have a free online engagement ring design tool that allows you to create the look you want at a price that appeals to your sensible side. With Brilliance on your side, you can enjoy a celebrity-inspired engagement ring that represents your love and life in a beautiful way.